The company producing the mascot for this year's World Cup has declared itself bankrupt after the toy failed to score with consumers. Nici paid 28 million euros ($36m; £19m) for the sole rights to "Goleo", a football-kit-wearing lion. According to reports, the firm has blamed weak demand for its problems. The Bavarian toymaker confirmed it had applied to the German courts for insolvency protection, but declined to give any further information. According to Coburg district court, Nici cited inability to make payments as its reason for filing for insolvency. The group's problems come just six weeks before the football tournament kicks off in Germany. Nici had expected the stuffed toy mascot - designed by the firm behind the Muppets, Jim Henson's Company - to have been a sure fire hit with consumers. However, it seems to have scored an own goal by choosing a mascot that has little connection to Germany, whose national symbol is an eagle. In fact, three lions are the symbol of Germany's greatest footballing rival, England. Reports also suggest that consumers are puzzled by the lion's state of undress - although it wears a number 6 shirt, Goleo does not sport a pair of shorts. 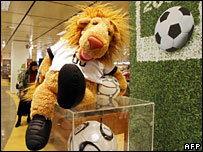 Nici, which has annual sales of about 130m euros, has not said how many of the lions it has sold. Goleo retails at 19.95 euros. The football tournament is widely viewed as a money-spinner for most groups who attach their name to the event. Adidas has already credited demand for football products ahead of the contest for a surge in demand and profits. The sporting goods group, which makes replica kits for teams including France, Argentina and host nation Germany, said profits rose 37% to 144m euros in the first three months of 2006.